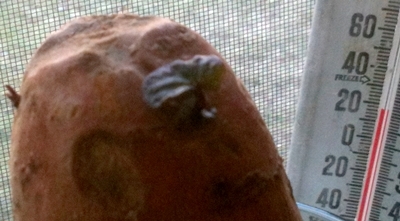 It’s not even 20 degrees outside, but I’m sprouting a sweet potato vine on the kitchen windowsill. By the time Spring is really here, I should have a hearty vine that I can keep rooting from cuttings. And then I can hang the vines in a basket outside my window. If I keep rooting the cuttings, I can hang a basket indoors all year. I need something to plan toward, look forward to — something other than the solitude of a long cold winter. even when winter shrouds the pane. This entry was posted in creativity, depression, gardening, photography, politics by Elaine. Bookmark the permalink.